Would You Brush Your Teeth with a Twig? Leen Sadder, a design student, had to redesign the first thing she threw away after class. She ended up throwing away a toothbrush. She redesigned, hell, re-imagined the toothbrush as a twig. Apparently, it works well. 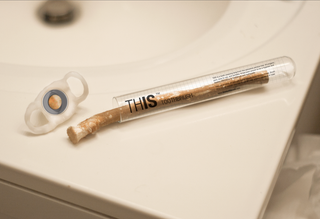 There's actually people in the Middle East, Pakistan and India who use a Miswak twig to brush their teeth. They bite off the top to reveal softer bristles on the inside (similar to a toothbrush). Her toothbrush, called THIS, cribs off that idea and creates solutions that better fit the American market. For example, instead of being forced to bite off the top, Sadder created a cigar cutter-like cap to do the dirty work. Plus, it's totally natural and biodegradable.